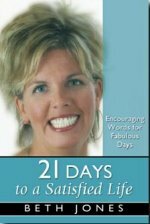 Description: In this 21 day devotional you will be encouraged to take steps to lessen stress, make time to know your Father God, and take care of the business of life with planning and patience. Even your craziest days can gain peace and serenity when you live according to God’s plan. Full of powerful encouragement and amazing ideas, this little book will inspire you to find satisfaction in all the right places: God, balance, a good marriage, godly kids, a place to serve, and purpose for living.